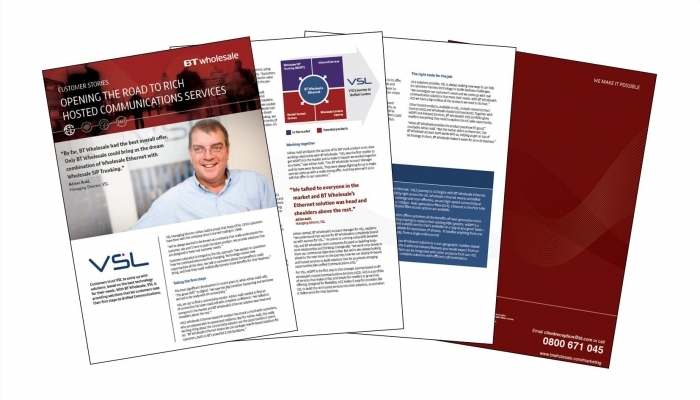 VSL’s managing director, Adrian Auld, is not exactly camera shy, so when BT Wholesale asked for a case study, Adrian was only too happy to happy to share the story of a great partnership. Developing strong supplier relationships is integral to being able to offer customers a first class service, delivering product that is relevant, reliable, and competitive. Adrian comments ‘VSL was the first reseller to get BT Wholesale SIP Trunks into the market and to make it happen we had to work together as a team’. Wholesale SIP Trunking – or WSIPT – certainly makes sense to VSL’s customers. “WSIPT is a big leap up from ISDN in terms of capacity and reliability,” says Adrian Auld. “It’s much more resilient and much more cost-effective for our customers.” Adrian Auld also likes how WSIPT fits with VSL’s product strategy. “We sell complete solutions with connectivity, service and products all part of the package. WSIPT is fully tested for interoperability with the Mitel’s hosted and on premise telephony solutions we offer.” He adds that WSIPT works seamlessly with VSL’s existing business systems. Billing data, for example, uses the same format as the old ISDN-based technology. “The seamless integration meant we could go forward with a new product that our back office took in its stride.” And going forward, WSIPT lets VSL have conversations with its customers about how their businesses can benefit from hosted services, call recording or diverse routing. The inherent flexibility of WSIPT makes it easy to deliver these kinds of value-added voice services.